A stylish bag that safely holds three flugel sized horns. 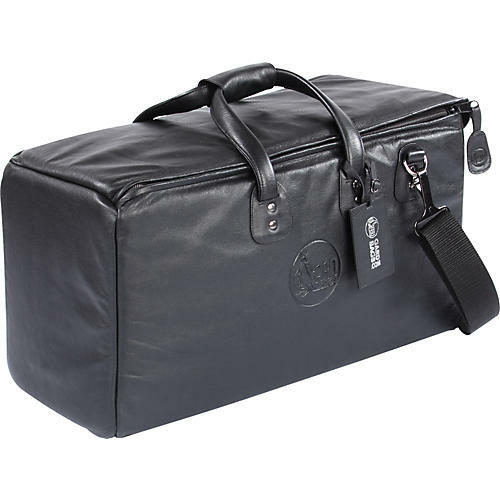 The Gard Super Triple Trumpet Bag is made of water resistant nylon or high-quality buffalo leather and has padded dividers to hold three flugel-sized horns. A generous zippered side pocket lets you also carry music and accessories. Other features include a removable shoulder strap, double zipper opening with a Velcro lid top, and brass bottom feet. In ordinary bags, the music instrument rests on the bottom of the bag. If dropped, the protruding parts are likely to be dented. In the mid-bag suspension system, the instrument is suspended in mid air inside the Gard Gig Bag, allowing the instrument to only have contact with the inside of the gig bag. The bell is fixed on the front with a foam cone. With the mid-bag suspension system gig bag, 9 out of 10 times the instrument will survive a drop or an impact unscathed. Protect your favorite horns! Order today!